Who are these people and what have they done with the incompetent fools who used to run the city of Johannesburg? As a long-time resident of the city I’m used to services not being delivered and no explanation being available. For example, just last Saturday night I was sitting watching a movie when at almost exactly eleven o’clock, the power goes out. I tried to phone City Power but either the call centre isn’t staffed late on a Saturday night or the single operator was off on an extended tea-break. The power eventually came back on after about six hours and I found out the next day that it was a widespread outage affecting several suburbs so it’s just possible the call centre was over-loaded. A contractors truck cruising North Road in Regents Park, Johannesburg. Fast forward to today, after some three weeks of Pikitup worker strikes, the streets of Johannesburg are a mess – or, rather, they were. It seems that somebody on the Pikitup management team actually does have a clue. The company has apparently contracted private companies all over the city (and provided security) to try and clear some of the garbage littering our streets. 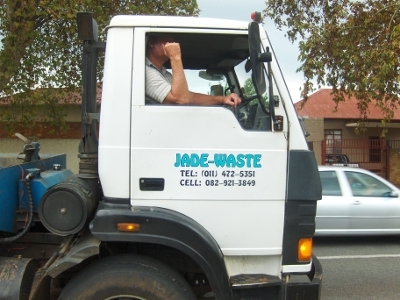 Alet Deysel, the owner of Jade-Waste, which is the company designated to clear the garbage in my area told me that all 40 of her staff volunteered to work today (Sunday) in order to do their bit. Presumably, once Pikitup have paid for the services they’ll all get a little something extra in their pay-packets. I also asked her about the car containing security personnel that accompanied each of her trucks and she said that was for protection in the event that the striking Pikitup workers take issue with the clean-up operations. World class African City? Maybe, just maybe. 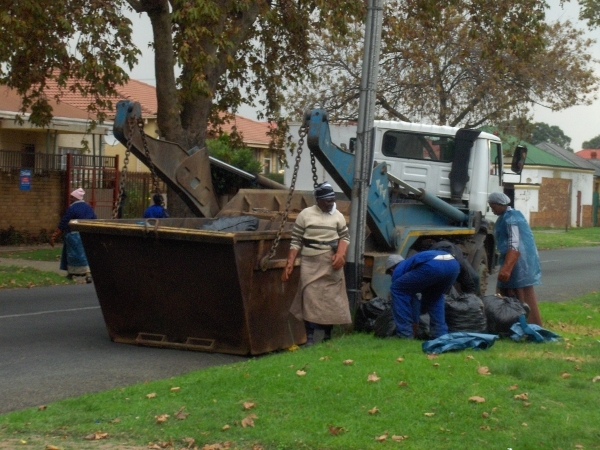 Volunteers clearing some of the garbage that has piled up since the Pikitup strike began.